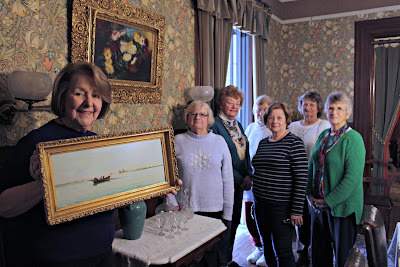 Questers Help Restore Two Physick Family Paintings - Cape May, NJ ~ The History Girl! The Olde Cape Lighthouse #1212 Chapter of Questers International supported the restoration of two paintings that were owned by the Physick family and original to the 1879 Emlen Physick House Museum, 1048 Washington Street, Cape May, New Jersey, which is reputed to be the finest example of Victorian Stick Style architecture in the country. The Physick Estate was lovingly restored and is managed, interpreted, maintained and opened to the public by the Mid Atlantic Center for The Arts & Humanities (MAC) year-round. Shown in the photo above, from left, MAC Curator Gail Capehart holds one of the restored paintings, the other hanging on the wall, and is joined by Questers members, Carol Hartman, Marge Wetherill, Joanne Heal, Rosalie Gallagher, Sonja Hippel and Barbara Oberholtzer. "The restoration has brought these paintings back to life," Capehart said. "We are very grateful to the Olde Cape Lighthouse Chapter for their generosity and care for these beautiful and historic pieces of art." The paintings were conserved by Jason Crafts of J&J Art Conservation Services in Mullica Hill, NJ and returned to the Physick Estate on January 19. The larger piece on the wall is an oil-on-canvas still life featuring a large red vase filled with chrysanthemums. The painting is framed in a Rococo style gilt molding frame. The painting was completed circa 1875 by an unknown artist. The smaller painting is an oil-on-wood panel depicting a New England seacoast scene and is framed in a narrow gilt frame. It was completed circa 1880 by an unknown artist. Both pieces were owned by the Physick family and donated to MAC by an heir in 1981. The conservation was completed with $500 in donations contributed by the Olde Lighthouse Questers. With a strong desire to see that the best of American heritage is preserved for future generations, Questers seek to educate by research and study of antiques and to donate funds to the preservation and restoration of artifacts, existing memorials, historic buildings, landmarks, and educational purposes. Questers work on defined projects selected by each chapter. MAC is a multifaceted not-for-profit organization committed to promoting the preservation, interpretation, and cultural enrichment of the Cape May region for its residents and visitors. MAC membership is open to all. For information about MAC's year-round schedule of tours, festivals, and special events, call 609-884-5404 or 800-275-4278, or visit MAC's web site at www.capemaymac.org.